New home nestled on Trout Lake just 10 min north of Lake George and 5 min South of Bolton Landing, close to fine restaurants and activities to fill anyone's day and evening. Ideal location for activities in Saratoga, just one half hour away. Relax and enjoy this luxurious home with a spacious Great Room with a gas fireplace, modern kitchen and spectacular views of Trout Lake. Five bedrooms have views of the lake. Two acres of private property with 150 feet of private sandy beach. You will experience sunsets as beautiful as Key West as you rest on the spacious deck overlooking the lake. Plan on fishing and enjoying Six Flags and the water activities in Lake George. Excellent fishing right off of your OWN dock. All bathrooms have tubs and showers. The design is very Adirondacks and interesting throughout the house. The house is located in the Mountains about a 1/4 mile from Coolidge Hill Road. Bolton a a quiet town with excellent restaurant and many bars and excellent shopping. The lake has incredible views of the Mountain and beautiful sunsets from the beach and the house. 150 ft of Sandy private Beach front. With a gradual grade for walking into the lake. we are directly on the lake. There are beautiful views of the mountains and the most spectacular sunsets. 5 of the bedrooms have sliding glass doors with magnificent views of the lake. The water front is 150 feet of Sandy Beach front that gradually takes you into the lake for swimming and water activities. 1 in the great room, which is a smart tv, and each bedroom has one the playroom has a 50" TV and they are all connected to time warner cable. backyard has multiple chairs and a firepit. front yard has a table and chairs and 4 patio chairs. Beach has 6 lounges and 8 chairs, umbrellas and a charcoal grill, 2 picnic tables on the beach. has a gas grill, table and 8 chairs, 2 lounge chairs, plus a couple more reclining chairs, several umbrellas to provide shade. This property on Trout Lake is very nice. The house is spacious. It has a private beach that is equipped with a canoe, two kayaks (one children's; one adult), and a paddle board, among other toys, such as sand toys and a floating flamingo. It accommodated my family very well. However, the security deposit is very steep and I had a feeling that the owners would find a way to keep some of it, which they did. Despite our best efforts - including vacuuming the entire house; cleaning all of the bathrooms; picking up any trash that might have accumulated around the grounds (most of which was not ours); thoroughly cleaning out the refrigerator and microwave; among other tasks - they charged us 10% of our deposit to essentially deal with a single soiled spot on one carpet in one of the bedrooms. They claimed the entire carpet had to be cleaned, and even though their cleaning service did NOT charge them anything extra to clean it, they felt they needed to charge us for the cleaning service's effort. (They are also particular about a number of other things - you'll get most of the list when you sign the contract - including you can only do one load of wash per day and you have to use only one kind of toilet paper.) We had already agreed to pay extra (more than the price on the listing) because they claimed the price on their listing only covers a certain number of people and we had more than that number, so we paid an additional price per extra person. AND we agreed to a change in our arrival time, which is different on the contract than it was in the listing when we saw it. So, we were more than flexible with the owners. They did not return the favor. If had a do-ever, I would go elsewhere. We would like to thank you fo confirming the fact the you had addition people in OUR home that exceeded our original agreement. WE Did Not add An ADDITIONAL charge even though we should have. You were in breach of our agreement. We noticed you complained about SCOTT toilet tissue being the only one you can use? WE SUPPLY IT! This is done because the house is on a SPECIAL leach system for all waste because we are RIGHT ON THE LAKE FRONT. You spilled coffee on our carpet and the cleaning people had to get a machine to clean it. They do not work for free. All other renters appreciate our concerns about environment because we try to be an ECO friendly home. Which obviously does not concern you! We keep the laundry demands low because everyone takes showers. Since you brought extra People that effects the lake and the eco system. We run a fair home for all. However we expect people to clean up severe messes or at least tell us. We believe in honesty an inter gritty in our guests. All other people are repeaters because we are Fair and Honest! My family has stayed at many lake houses in the Lake George area over the years, and this house is by far one of our favorites. The house is very spacious, so even with 15 of us in the house there was more than enough room. Phil and Pat had thought of every necessity for our stay, and even left us two bottles of wine upon our arrival. The beach area is so well kept, and having the kayaks, canoes and paddle boat were awesome! Everyone had such an amazing time that none of us wanted to leave. Thank you Phil and Pat for your hospitality. It is difficult to know what to say that has not been said by previous reviewers. Pat and Phil have an outstanding home. We have never seen a vacation rental home so beautifully appointed with attention to detail. We had 12 people including 3 grandchildren. The 7 bedrooms were more than enough. Toys and books for young children. Plenty of water toys for the kids and adults. The beach and waterfront were perfect. The grounds are beautiful. It says a great deal that all siblings and spouses are in hearty agreement that we should make our reservation for next year. Beautiful beach and sunsets. All we can say is WOW! Trout Lake is just gorgeous. We spent countless hours watching the children play in the water, fishing from the docks, and kayaking in the lake. We even came to love the stair climb back to the house. It's long and we certainly needed it after all of big family dinners we made in the well equipped kitchen. We loved descovering all of the personal touches along the paths around the property too. The play room and the loft got a ton of use too and the children and adults alike enjoyed the nostalgia of the Disney VHS library. We were so sad to see our trip come to an end and we hope to be back soon! Thank you for giving us the perfect vacation! It is a wonderful for us to share our home with caring people. They take care of it as if it was their own and we love to share our LOVE of the house with others. We recently stayed at this house for the second year in a row. My family and I love this house. It is spacious, clean, and is well stocked with all the amenities. It's so nice to have your own private beach. They even provide you with kayaks and a paddle boat. 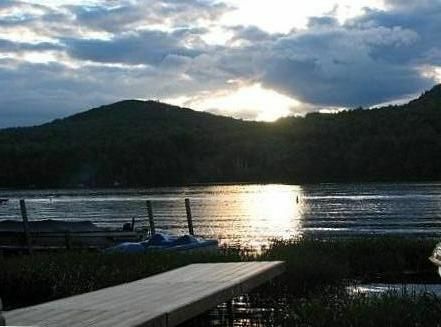 Being situated between Bolton Landing and the village of Lake George is a big plus. You're only about 10 minutes away from each. The owners are great to deal with. They are always willing to help if you need anything. The welcome basket is a nice touch with a bottle of red and a bottle of white. Plus coffee. If we go back to Lake George next year this is the only house we would rent. We were 14 and had more than enough room. Thank you for renting this lovely home to us. Trout Lake is a beautiful lake that is ideal for boating, waterskiing, canoeing,etc and the house has 150 feet of lake front sandy beach area. The beach front is private and ideal for sun bathing, swimming and for children. Trout lake sits in a valley with beautiful views of the mountains and sunsets. You will love the tranquil atmosphere and the beauty of the lake. The fishing is excellent for Bass and trout and can handle boats up to 17 feet with no more then a 50hp motor. You will love your trout lake experience. Our Refund policy is as follows, 90 Days prior to check in 100 percent refund 45 Days prior to check in 50 percent refund 30 Days prior to check in 20 percent refund Under thirty days there will only be a refund of the deposit. No other refund under the 30 Days!